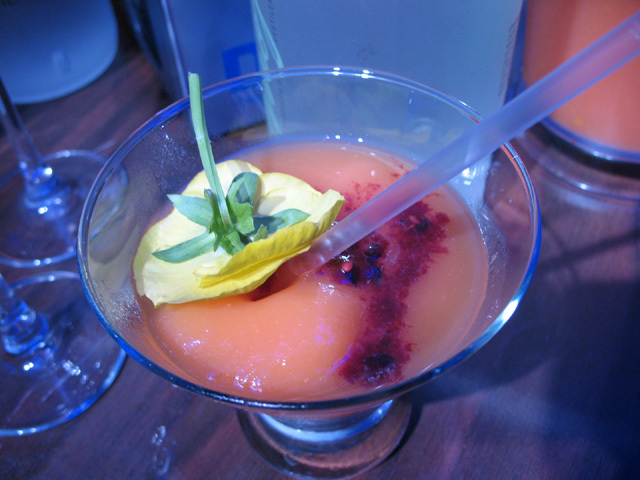 Second in a series recapping the 2010 Manhattan Cocktail Classic. 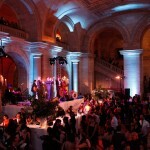 Craftsmanship and artistry were certainly in focus during the seminars and events scheduled for the days ahead, but the Gala was an epic soiree that was all about extravagance. This was a bacchanal that would have made Cecil B. DeMille proud. Magicians? You got it. 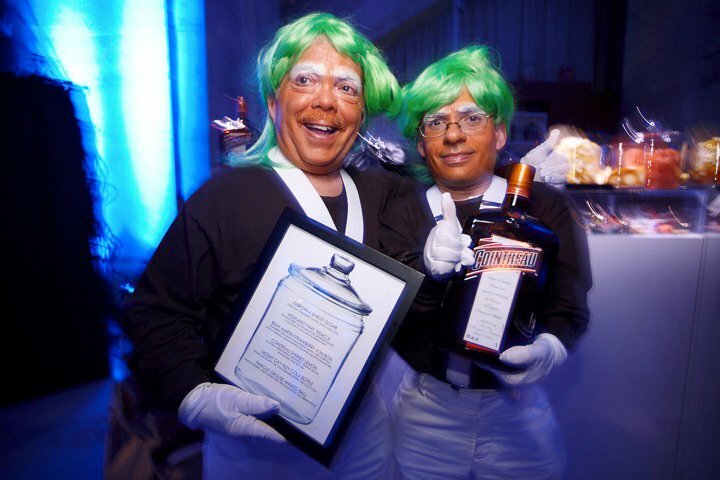 Oompa-Loompas? Sure, why not. A recreation of the legendary Stork Club? Absolutely. There weren’t any stilt walkers or fire breathers that I’m aware of, but they would have felt right at home. The queue outside was long, but thanks to a fast check-in, the wait was brief. 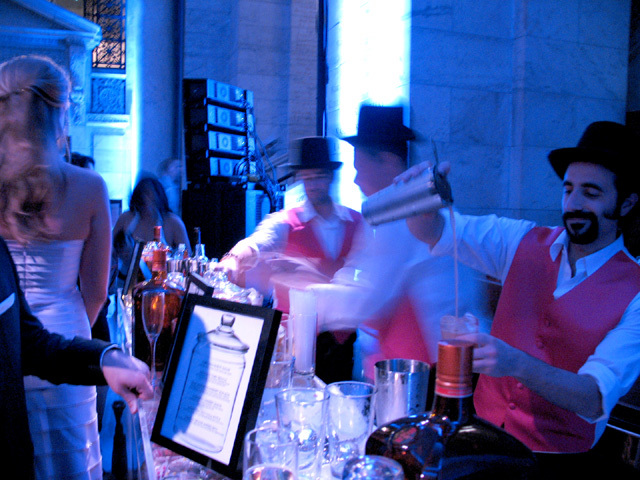 Once inside the cavernous Astor Hall, guests were greeted by a live band and a dazzling array of cocktail choices. Thankfully, we were given maps that showed the locations of dozens of spirits brands throughout four floors of the building. Game on! 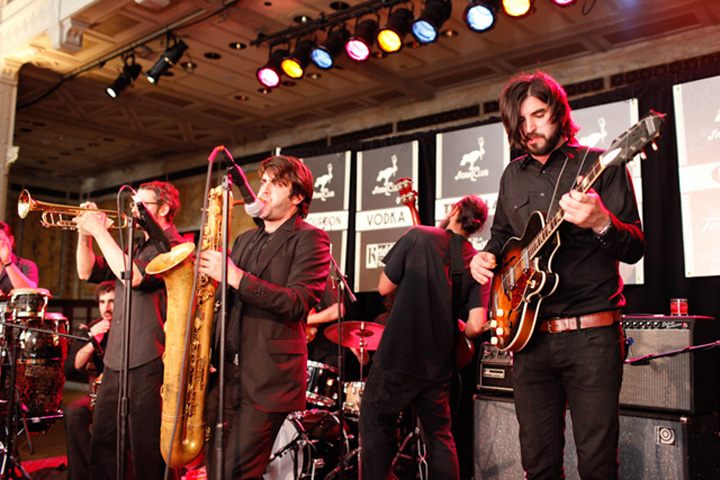 Damon Dyer and the Vieux Carré Lullaby. 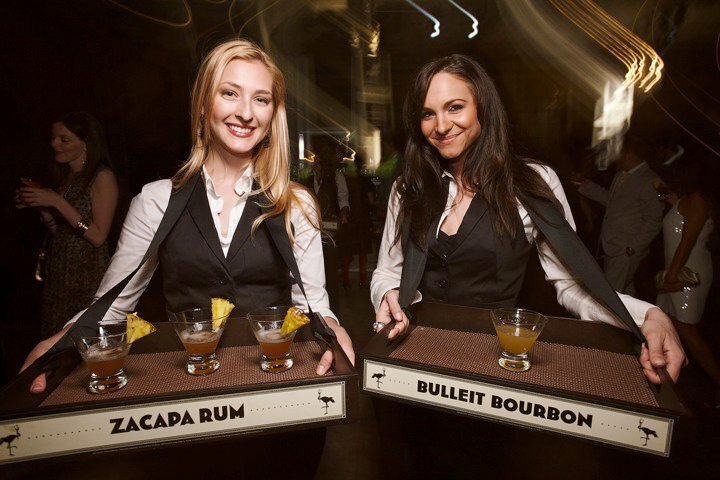 Bluecoat and Chandon were among the brands stationed in a prime location along the foot of the stage, just inside the entrance. 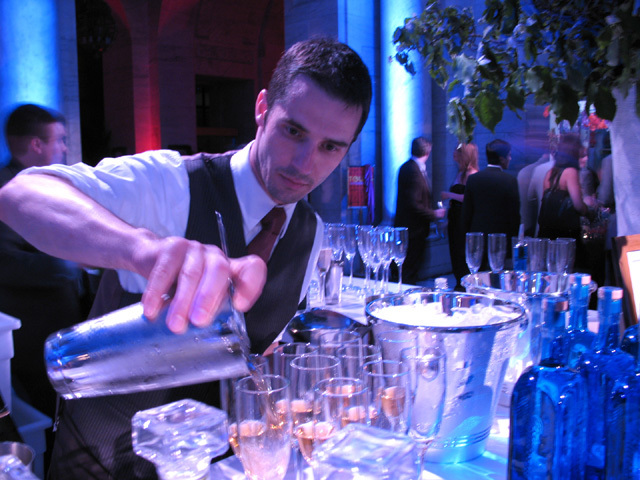 Champagne flutes were snapped up by thirsty guests nearly as quickly as they were filled. At one end, Damon Dyer (Clover Club) was mixing the Vieux Carré Lullaby: Blume Marillen Apricot Eau-de-Vie, Marie Brizard Apry, a few dashes of Vieux Carré Absinthe Superieure, topped with Chandon champagne. The first cocktail of the night, and a nice aperitif for the hours of liver stretching that were to follow. Nearby was the colorfully decorated Los Amantes booth. Among the offerings was the Florita de Oaxaca: hibiscus flower-infused Los Amantes Joven Mezcal with fresh tangerine reduction, agave, and lime juice, served dusted with dried chipotle powder. Down at the end of a hall was Hendrick’s Gin, which should be a lock to win the award for Bar Most Likely to Appear in a Terry Gilliam Movie. 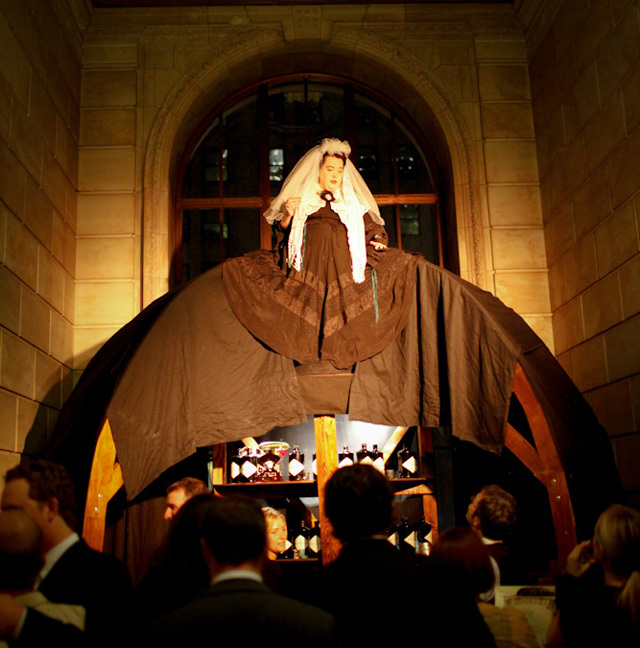 “Queen Victoria” sipped a martini and held court above the crowd, while the bar itself was set up beneath Her Majesty’s enormous black mourning dress. Sadly, the long queue was enough to deter me from sampling the libations. Highland Park Treacle, comin' right up! Then, cutting through the noise of the crowd and music, came the magic words: “WHO WANTS SCOTCH?” I followed the voice and found myself at the Rémy Cointreau station, where four bartenders in pink vests and top hats were slinging drinks. In no time the carnival barker presented me with a Highland Park Treacle: Highland Park, Angostura, demerara sugar, cloudy apple juice, and an orange twist. Guests could detox and decompress in The Virgin Room. 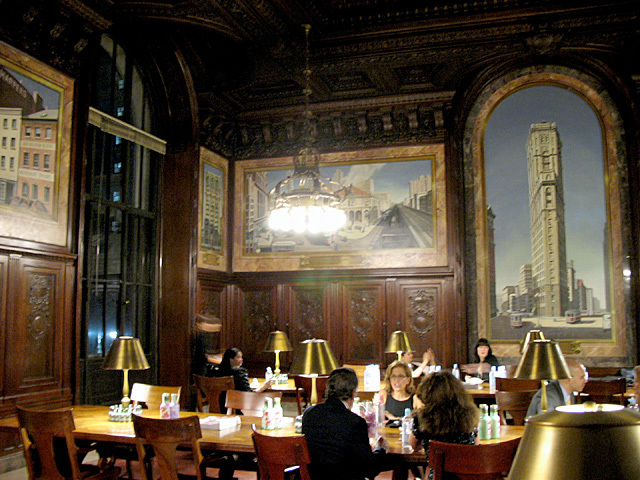 Around the corner and down a hall, the Periodicals Room had been converted into The Virgin Room, a quiet refuge where guests could detox with water or rejuvenate with energy drinks. Other than the Virgin Room, water was in short supply at the Gala. Considering the oceans of booze that were easily available, a few extra water stations here and there on each floor would have been invaluable. And depending on where you were in the Gala, it could be sweltering, yet another reason for more water stations. Food was just as scarce if you weren’t one of the lucky ones who made it past security into the Fatty ‘Cue feast on the Second Floor. A few perfunctory amuse stations could be found elsewhere, but not nearly enough for what was needed for the hungry masses. Upstairs, you could walk through a gallery for Experience Cognac, which included a timeline displaying the spirit’s history from 1800 to the present. 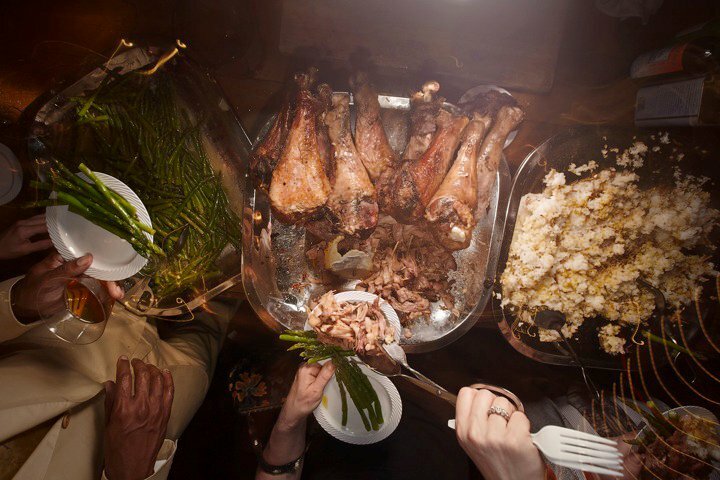 Tastes were offered and questions answered as you made your way down the exhibit, a hallway of relative calm amid the frenzy of the Gala. 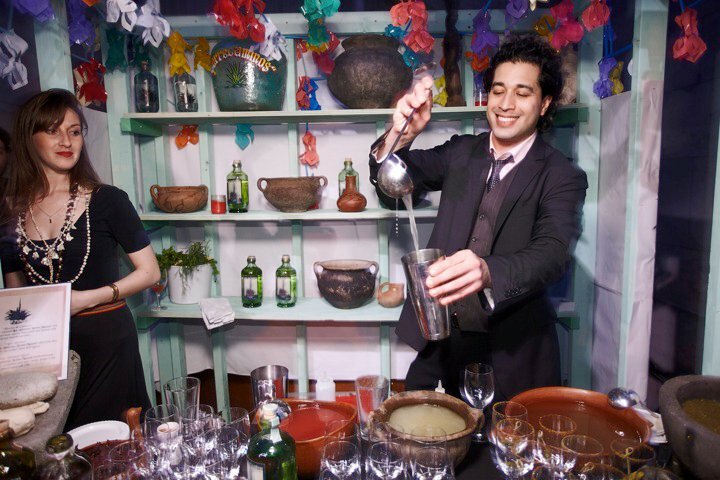 DonQ mixologist Ramsey Pimentel chills out. 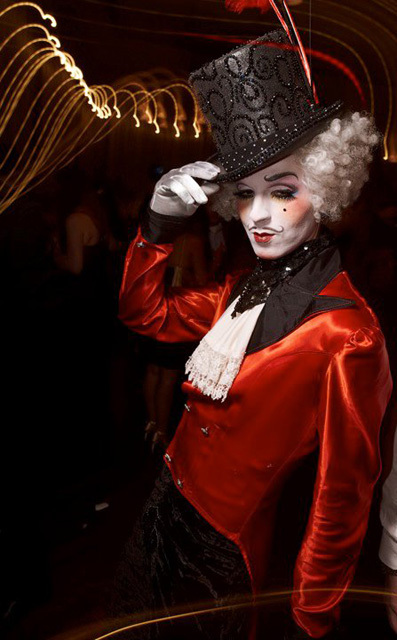 Adjacent to the gallery, DonQ Rum had taken over a room to host a lively party-within-the-party. The multimedia experience offered dance grooves, video displays, ambient blue lighting, and iPads for people to check in on foursquare and enter to win one. 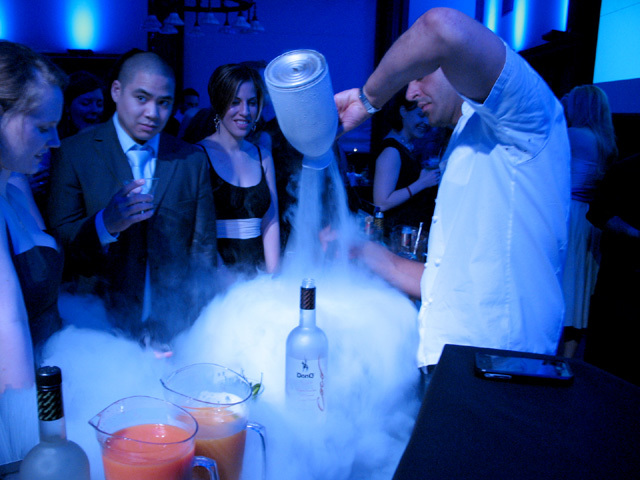 Three mixologists were stationed throughout, including Ramsey Pimentel, who used liquid nitrogen to create a frozen DonQ Parcha, made with DonQ Pasión, lime juice, and cherry-basil. 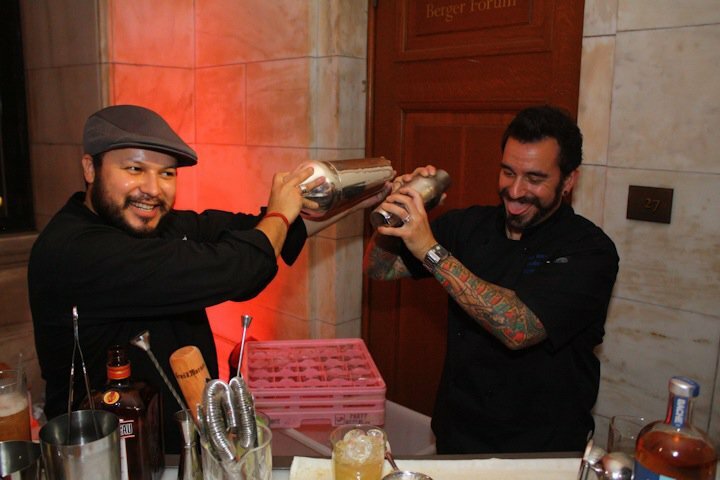 Outside the DonQ room and at the end of the hall, the dynamic duo of Sean Kenyon (Steuben’s) and Danny Valdez (Cure) was shaking things up. 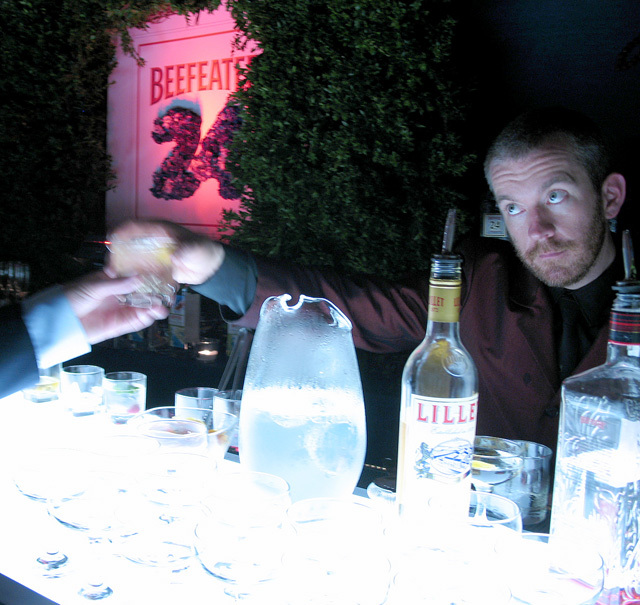 At this point in my odyssey I was joined by Stephanie Jerzy (Cocktail Culture), my liaison to all things Beefeater. As we waited for our drinks, I turned around and realized that Robert Hess was standing behind us. I told him how much I enjoy The Cocktail Spirit with Robert Hess before he moved on to the next station. I’m fairly certain I scared him away. 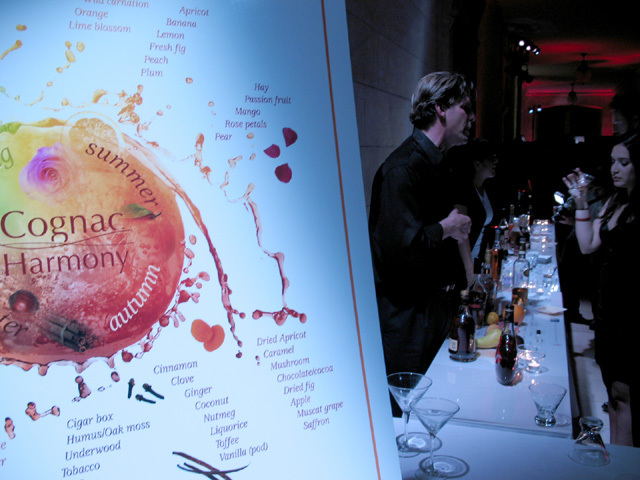 At the other end of the hall, the Michter’s crew offered various Manhattans and Old Fashioneds. With all the new and exclusive cocktails on offer I probably didn’t need to add a Michter’s Rye Manhattan to my tally, but the Belvedere room was just ahead, so I needed the fuel. 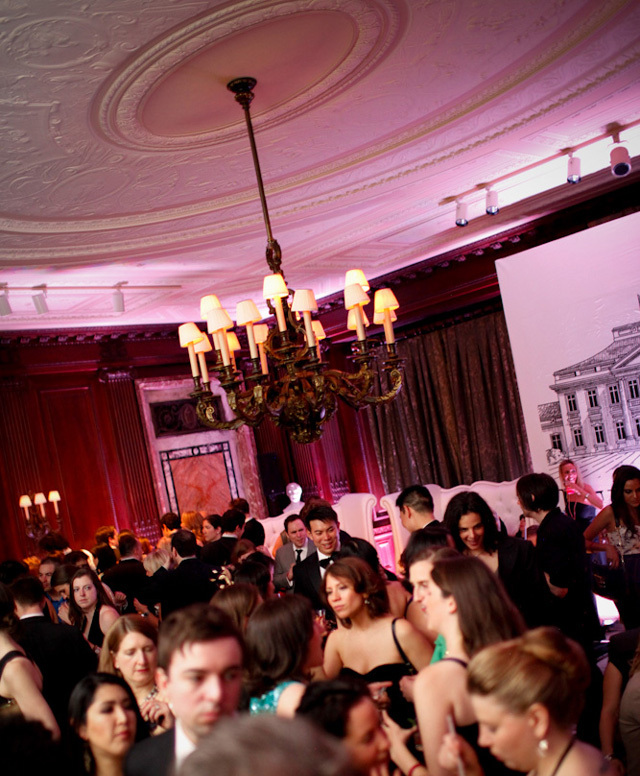 Once inside, we found one of the Gala’s few comfortably cool spaces, a violet-hued room with white leather furniture and another DJ-driven dance floor. T.J. Lynch serves up a Summer Gin Punch. Stephanie then led the way to the Beefeater station on the First Floor, which I’d somehow missed earlier. At the underlit bar, T.J. Lynch (The Breslin) was serving a Summer Gin Punch, made with Beefeater Summer Edition, chilled green tea, St. Germain, maraschino liqueur, topped with Prosecco. The Summer Edition limited release is not yet on sale, so this cocktail was a special treat indeed. Downstairs on the Ground Floor, Diageo had turned the spacious Celeste Bartos Forum into the Stork Club, complete with Sherman Billingsley portrait. Perhaps because it was a little harder to find, the Stork Club was cool and comfortable. Among the cocktails being served were a Bulleit Mint Julep and a Mary Pickford, a 40s classic made with Ron Zacapa Centenario 23, pineapple juice, grenadine, and maraschino liqueur. With room to move and The Budos Band laying down the Afro-Soul, the joint was jumpin’. The Stork Club was easily the consensus favorite part of the Gala for MCC attendees I spoke with later. After finishing on this high note, it was time to stop by the Virgin Room for some much-needed water before heading home. It’s been a week since the Gala, and my synapses are still misfiring. 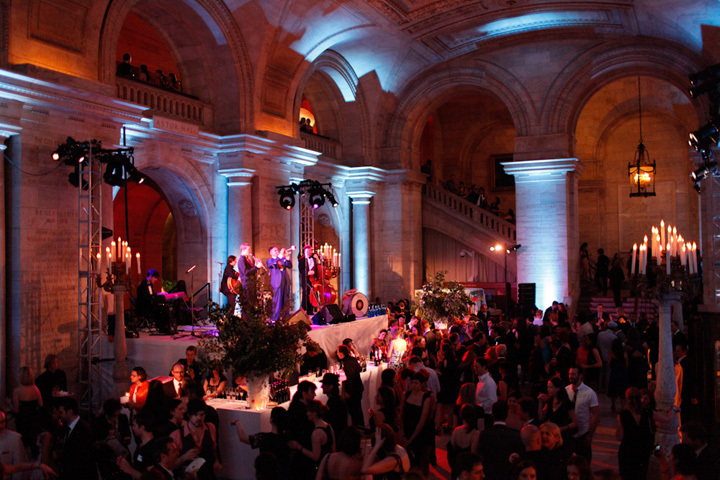 The grand location, audio-visual overload, eclectic touches, beautiful people, and of course the cocktails, made the Gala a spectacular success. Let’s do this again next year, shall we? 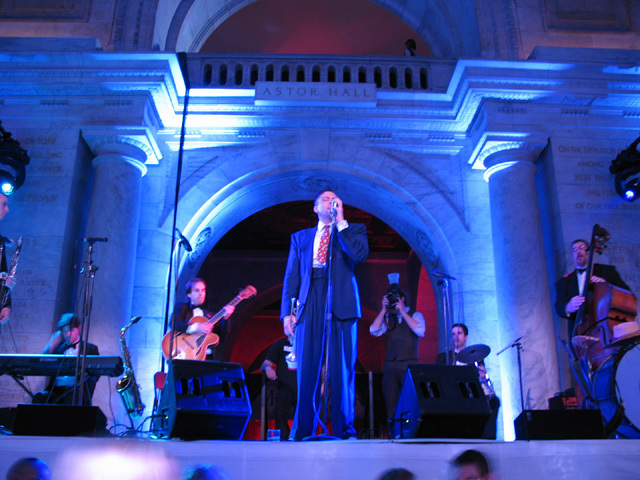 For a comprehensive list of Gala coverage, visit the MCC News page.